Modern equestrian statue of Alexander on the seafront of Thessalonika. This larger than life 20th century sculpture of Alexander stands on a high plinth at the southeast end of Thessalonika’s long promenade, near the city’s trademark White Tower (Lefkos Pirgos) and the Achaeological Museum. It portrays the great conquerer, placid but resolute, his sword at the ready, looking into the far distance; he faces eastward, towards Asia. The drama and excitement in the monument are provided by the agitated state of his horse, the renowned Bucephalos, echoing ancient portrayals of Alexander in action. As in ancient depctions of him, such as the Alexander Sarcophagus, he is shown wearing a short cloak which billows out behind him, rather like a modern comic book super hero. 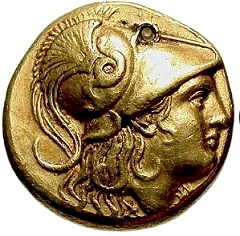 During the 20th century Greece as a whole and Macedonia in particular rediscovered Alexander in a big way. Once again he is seen as the great pan-Hellenic hero, a defiant unifying symbol and a heritage trademark both for the country and the region. Statues and busts of him can be be found in many town squares and in the lobbies of public buildings. Even the airport of Kavala has been named after him. You are a dear friend!!! Thank you for being there for me from the very beginning!!! Thank you for being there for me my friend. I’m grateful for your support from the beginning, and it’s been a great pleasure to get to know you, you have been an inspiration for me. In the time of crisis in Greece now, what a good time to remember the glory of Alexander today.